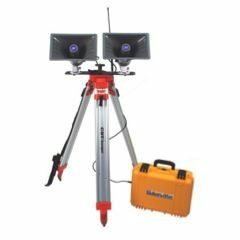 The What: Whether you need a temporary means of transmitting announcements or a low cost, rapidly deployable package for disaster relief teams, the AmpliVox All-Weather Hailer PA System SW6240 does it all. The What Else: The entire system contains a communication case and a set of speakers that can be easily transported and set up by one person. All electronics are housed in a rugged, sealed, fully weatherproof carrying case. Use your own 2-way radios (two are needed) or the AmpliVox MURS radios for the communication devices. One 2-way radio acts as the receiver and is located inside of the weatherproof case connected to the external antenna and speakers. Using the other 2- way radio as a microphone, you can transmit messages up to 2 miles away.